L.A. at that time was full of construction sites strewn with leftover 2-by-4s and other scrap wood with no other destiny than to become firewood. Over a year I collected these scraps and glued and sanded them with a large electric orbital sander. Finally, I could sit on my sculpture and rock, without my feet touching the ground. My professor, the minimalist sculptor John McCracken, gave me an A. In contrast, my painting teachers laughed at me. That piece marked a transition in my career. I had planned on becoming a painter, but the satisfaction I got out of making that rocking horse made me a sculptor. 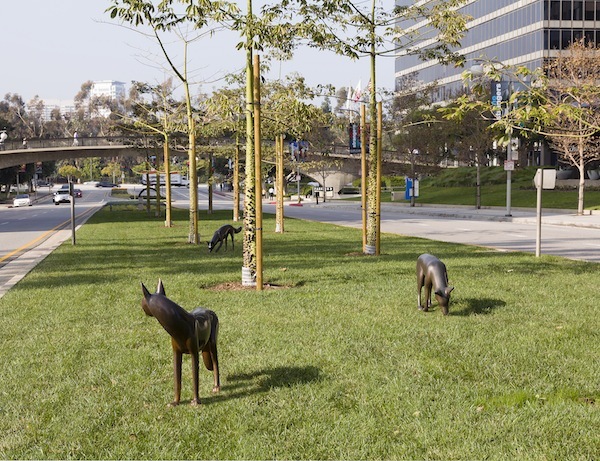 Much of my work has been displayed in indoor art galleries and museums, but my most current exhibition is installed outdoors, on a near-mile-long stretch of public-access property: the median strip that runs down the center of Avenue of the Stars, in Century City, amid the canyon of office towers. The exhibition—which opened in November 2012 and will extend until January 27, 2014—includes 22 bronze sculptures that I made over 30 years. The subject matter is animals and birds, and the sculptures are all made of bronze cast, using the lost wax process, a technique that dates back to ancient civilizations. You could view the installation by walking along the sidewalk and peering across multiple lanes of whooshing cars—but you’d need stamina and a lot of time. So instead, I suggest viewing these sculptures from a moving vehicle. At first this might seem an abomination: Isn’t art meant to be experienced close-up, on a human scale? But this is how we live in L.A. So much of our experience of the city is from our cars. And “drive-by” art in L.A. isn’t new. We have many permanent public artworks, like murals and architecture and pieces like “Urban Light” (the collection of street lamps in front of LACMA). 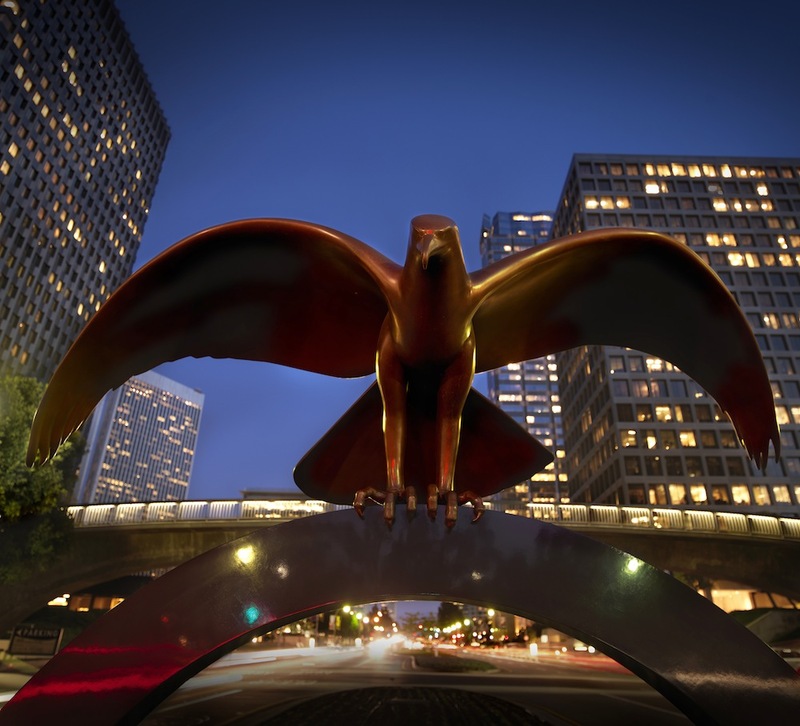 I suggest beginning your tour at the northern, Santa Monica Boulevard end, of Avenue of the Stars, with the “Big Flying Eagle.” This piece is the second casting of an eagle that was originally commissioned by Target Corporation. The original was placed on a 22-foot bronze branch, and it stands in the lobby of the corporate headquarters in Minneapolis. I chose to place this second eagle on a simple arc, to echo the curvature and abstract shapes of the wings. Although I try to stay fundamentally true to the form of the subject I have chosen, I like to push the form until it feels almost more abstract than figurative. For example, I rarely use fur, feathers, or eyes in animal and bird forms. I depend on the negative space that surrounds the sculpture to imply movement and impart a lifelike presence. Continue driving south toward Pico, keeping an eye out for three coyotes moving through the tall grass. “The Coyotes” are my earliest work in the exhibition. Inspiration for these pieces came from watching coyotes near my home in the Santa Monica Mountains. In this work, I wanted to express what I felt was the coyotes’ relationship to one another within a group as well as their strength as singular hunters. If you’re driving during the day, “The Coyotes” will be easy to spot. However, I think all the sculptures become even more intriguing at nighttime, when ambient light from the surrounding buildings casts a glow, gently illuminating the outlines of the sculpture. As night wears on and the light disappears, the environment becomes subdued and mysterious, conveying a secretive feel, as if the sculptures are covertly wandering around in the dark. 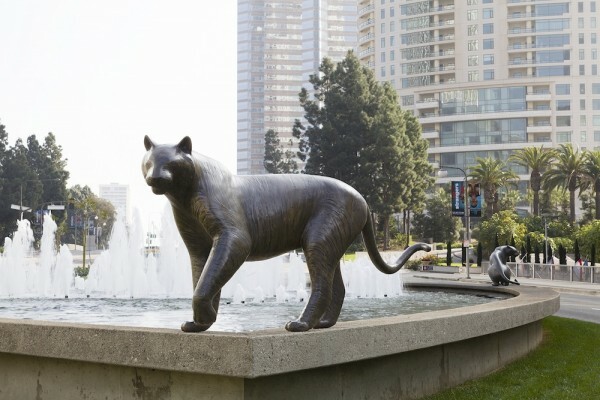 As you cross Constellation Boulevard, you’ll see five life-sized tigers lounging around the oval pool of a fountain opposite the Century Plaza Hotel. These tiger pieces evolved out of my fascination with circuses and how wild animals are trained to relate to humans in an unnatural way. “The Five Tigers” were originally exhibited in a gallery setting, in a circle, looking inward toward an imaginary trainer. For this installation, I’ve placed them on the rim of the fountain, facing outward toward the public. “The Five Tigers” were returned to California from the East Coast, where they had been on loan to a sculpture park. Initially, I worried that their weight would prevent them from being placed on the edge of the fountain, but with careful calculation we determined the fountain would hold them. I’m glad: They’re perfect there. “The Horse” and “The Running Saluki” come next. They’re the only domesticated animals in the exhibition. In making both pieces I was experimenting with movement and playfulness. I depicted both animals running, and although I didn’t originally make them as a pair, when they were installed together, I saw an interesting relationship develop between the forms. A dialogue, or a story, emerged. The next piece is the only sculpture not installed on the median strip, and it’s a bit difficult to see from this side of the street, so you may need to view it on a return pass going in the other direction. If you look east, across Avenue of the Stars, where an off-ramp comes up from Olympic Boulevard, you may see the curved horns of a bighorn sheep. 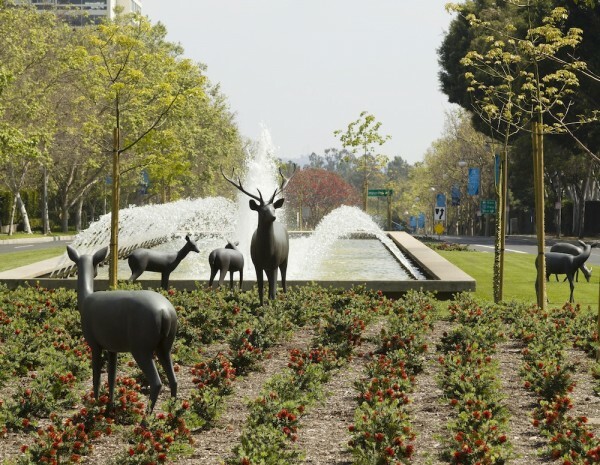 “The Bighorn” originally began as a commissioned piece, a part of the public art component for a large development in Pasadena. I chose the form to represent the mountain sheep that live in the nearby San Gabriel Mountains. The Pasadena edition sits on top of a fountain created from a stack of natural limestone blocks. This one stands on a limestone plinth amid some grasses next to a traffic light. Just a bit farther along, back on the median strip, are two big cats: “Lying Panther” and “Standing Panther.” I originally made these as part of a commission for private clients who asked for a pair of “Florida Panthers” to flank the entrance to their Florida home. I have been intrigued by the cat form throughout my career. My body of work includes domestic cats, bobcats, cougars and panthers, cheetahs, and tigers. I seem to find never-ending possibilities in the cat form. I especially like to work with the motion inherent in the body and tail. The final piece in the installation, a group of “Eight Deer,” stands at the southern end of Avenue of the Stars. Seen from our approach from the north, three or four deer appear to be framed by the water spouting from a long fountain behind them. As you drive closer, more and more deer appear—almost a herd. This is my favorite part of the exhibition to view at night. The deer silhouettes become mere shadows, almost lost in the dark. If you’re viewing them during the day, you may be able to spot something that has happened over the year and a half these deer have been placed here. The spray from the fountain has turned the patina on some of them a beautiful green on one side. Although I could control the bronze so it doesn’t chemically react in this way, I like the idea that something as seemingly permanent as bronze can change in response to the environment around it. I like, too, that my work can change over time, out of my control. Sculpture isn’t like painting, where the color has to be exact. In sculpture, form is the focus, and color is at most secondary. Gwynn Murrill is a sculptor who lives in Los Angeles. The Avenue of the Stars exhibition was made possible by an invitation from Carl Schlosberg, a private art dealer and collector, and was organized by the Century City Chamber of Commerce Arts Council. It will remain on view until January 27. *Photos courtesy of Gwynn Murrill Studio. Big Flying Eagle, 2012 - Matthew Fried Photography. Coyotes, TIger 3, Reclining Panther (Foreground) and Standing Panther, Deer 1 (Foreground) Deer 5, Deer 6, Deer 3, Deer 9, Deer 7 (L to R, Background) - Courtesy LA Louver, Venice CA.